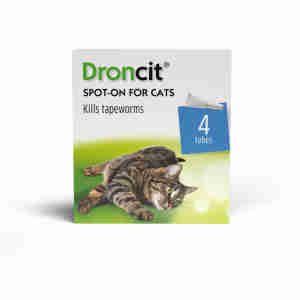 Droncit Spot-On combines a high level of efficacy against tapeworm in cats with the convenience of a "Spot-On" formulation. Each pack contains 4 tubes, sufficient to treat two cats of average weight. Use Droncit Spot On at the first sign of worms and/or every three months to keep your cat protected all year round. First time using these drops. Always used the oral tablets before. Must say it is much easier and my cats did not have any adverse effects. Very easy to use, no mess , would definitely buy this product again. Excellent service well packed with fast dispatch.